Having the ability and the gear to dive can save huge amounts of money, substantially increase your safety margin, and give you and your crew a dimension of pleasure that you may have never dreamed could exist with cruising. I’m not talking about deep diving. I’m not even necessarily talking about scuba diving. I’m talking about diving just deep enough to spend time underwater inspecting and working on the bottom of your boat—and safely exploring surrounding areas in relatively shallow water. I’ll give you some examples of things I’ve been doing for many years simply because I can go under and stay there for awhile. I avoid annual haulouts. It isn’t unusual for my 53-foot boat to go three years between these costly and hassled events. I repair underwater damage (only on other boats—so far). There are various products on the market that you can use to make quick, temporary repairs even when your hull is breached. I change zincs. I change propellers. I inspect through-hulls, props, shaft, struts, and other underwater metal that could be impaired by electrolysis or other things. I inspect the rudder and its shaft. I keep my bow thruster propeller and tunnel clean, an absolute necessity if your thruster is to deliver its punch. I change the thruster propeller if it gets damaged, which is not an unlikely occurrence. I clear obstructions in intakes (for example, when a piece of plastic is sucked over the air conditioning intake). If there’s any question, and if the conditions allow me to safely do it, I also check my anchor to see how well it’s dug in. I even swim around sometimes before and during storms to check the anchors of boats upwind of me—again, only if the conditions allow me to do this safely. I’m not a professional diver or a deep diver. I’m just an average type of guy, a bit puny, and a bit poor. Many ask, “Why not just hire a professional diver?” Often, this is indeed the best thing to do, and there are times when I use them. But there are many times when there are none available or when the mere fact of waiting for one will add to the problem or increase the damage. If you crunch your hull on a rock or reef, it may be important to inspect for damage immediately—and even make a temporary repair. If a mishap occurs in an out-island anchorage in the Bahamas or in a pristine, isolated wilderness cove in the Pacific Northwest, you may be the only one there. If you and others are preparing for a blow in an anchorage, there probably won’t be any professional divers to check to see how well your anchor is set, and if there were, would you trust their evaluation, not knowing anything about them? If you’re out at sea and you snag a commercial fishing net or wrap a piece of polypropylene line around your prop, you’re not going to be able to call anyone. You’re going to be sitting there rolling like a pig, maybe watching a storm close in, until somebody dives in and cuts the line loose. Also, I’ve found (and I’m sure you have, too) that there’s nothing like an owner inspection or an owner repair to be sure that the information you get is good or that the job is done well, especially if the job or inspection is “where the sun doesn’t shine.” I’ve gotten to know many good divers, and I’ve been impressed with their excellent and honest work. But I’ve also occasionally seen hulls “cleaned” that were only really cleaned to a point just below the waterline. I’ve also seen hulls “cleaned” when the only significant cleaning was to the props, the diver having the thought that the increase in speed caused by clean props would mislead the owner into thinking that the entire bottom had been scoured. In addition to the safety and money-saving benefits, the ability to do even limited diving will give an entirely new meaning to your cruising. It’ll allow you to become familiar with that fascinating world around the boat beneath the waves. It’s fun! Just seeing the bottom of your boat, that hull that’s carried you through oceans or down rivers, gives a very special feeling of appreciation and exhilaration. Exploring nearby shallow coral reveals a beauty that you’d never imagine from the other side of that surface of water. I can’t imagine anyone ever tiring of looking for shells, watching fish, swimming over waving plant life, or seeing the ocean bottom fall away below them in canyons and valleys and caves. What we’re discussing is not for everyone. There are serious safety issues unless you have the required ability, skill, and knowledge. There are also serious safety issues even if you do have these attributes. You’ll have to judge whether it’s for you and proceed with caution. Obviously, you’ve got to be a good swimmer. You also have to be able to exert yourself vigorously for sustained periods of time. You’ve got to be in good shape. You have to be familiar with relevant diving principles. Although I’m talking here of going down probably only a few feet, you should know about decompression, breathing, and many other issues. (There’s so much you can do and so much fun you can have within 10–15 feet of the surface that this could be enough for several lifetimes.) But many of these things, certainly the ability to swim and being in good shape, are important anyway if you’re going to be doing much serious, long-term cruising. If you’re at a stage of life where this is not for you, younger crew or help may be in the picture. If one of them can safely go under, you’ll reap many of the benefits. You also must learn to recognize potential hazards. For example, you need to know not to go in when there’s too much current. If you do have to go in, you need to know how to rig a safety line and how to deal with it without getting tangled in it. You need to know about the hazards of waves raising and lowering that hull like a giant sledgehammer on your head—and how to deal with this if it’s absolutely necessary that you be in the water. When I’ve had to go under when the hull was heaving, I’ve usually held on with one hand so that I’d move with the boat, although this isn’t always possible or safe. Sometimes it’s simply too dangerous to get in the water. You need to appreciate sea creatures. We all know about sharks and barracuda. Both of these can be dangerous under certain circumstances. For example, sometimes barracuda hang out under boats at anchor. If you’ve just thrown over scraps of fish edibles, the barracuda may be excited enough to think you’re dessert when you splash in. Sea lice can be another problem. These are tiny larvae that can cause welts and extreme itching, particularly if you’re susceptible to them. Sometimes these will appear in clouds in anchorages in the Bahamas, Caribbean, and other areas of lower latitude. Diving into sea lice can make for a memorable event—for more than a week to come. Fire coral on the bottom (you may encounter this in the fun explorations) can be quite toxic to some people. Barnacles on struts, shafts, or the hull can give you innocent cuts that can lead to serious infections such as Mycobacterium marinum. Heavy gloves, long-sleeve dive suits, and dive boots under flippers can help guard against this. 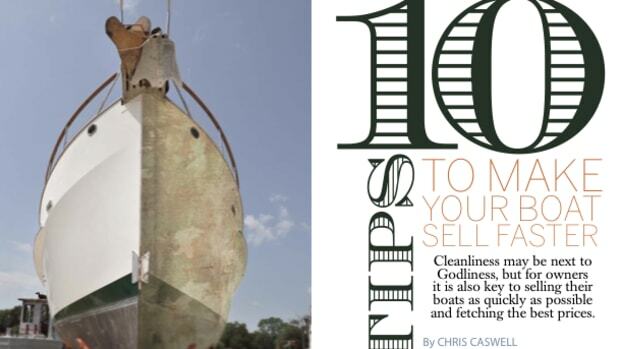 If I need to work on the bottom of my boat, I try to arrange an ideal setting if it’s at all possible. I prefer to take the boat out to anchor in a quiet area of relatively clear water and a sandy (preferably white) bottom. I can feel much safer about electrical current from other boats or from the dock out here, and I know how to turn off whatever may need to be turned off on my boat. With a white, sandy bottom I have a reasonable chance of finding the stuff that I drop (tools, parts, you name it), and it reflects sunlight, making a brighter working environment with better visibility. I look for a shallow spot, so that I can get good reflection from the sand and easily go down and get the things I may drop. However, it’s important to pick a spot that’s not too shallow. Not only do you want to avoid bottoming out with a wake or wave, but you also want to have plenty of room between the bottom of your boat and the bottom of the sea so you can work with no fear of being pinned, including when the boat’s in the trough of a wake or wave. This means that, with my 5-foot draft, I prefer to anchor in at least 12 feet of water. Also, needless to say, it’s important to watch the tide, particularly in areas with a wide range between high and low. I prefer an area with no, or relatively little, current. Fighting current adds to the effort and the job. However, if I’m cleaning or scrubbing the bottom, I look for enough current to clear away the mud and debris as I free it from the bottom so that I can maintain good visibility. It will also help to wash away the various little sea creatures that I may be displacing from their homes on my hull. Sometimes, my bottom has been covered with tiny shrimp-like creatures living in the thin layer of mud that’s caked on my bottom after periods of sitting at anchor or at a dock in an area with exceptionally muddy currents. I’ve come up with my wet suit covered with the squirming creatures, looking like a recently exhumed zombie in a cheap horror movie. They’ve never hurt in any way, but they don’t improve my day, especially when I peel off my wet suit and find they’re inside, too. Moderate current is a help when these things show up. You can use many tools below the water that you might use on your boat above water—except, of course, electrical tools, pneumatic tools, high-end precision tools, and other tools of that nature. I regularly use socket wrenches as well as screwdrivers, hammers, crescent wrenches, and Allen wrenches. The key is to wash them thoroughly in fresh water when you’re finished and then soak them thoroughly with a product such as CRC 6-56. 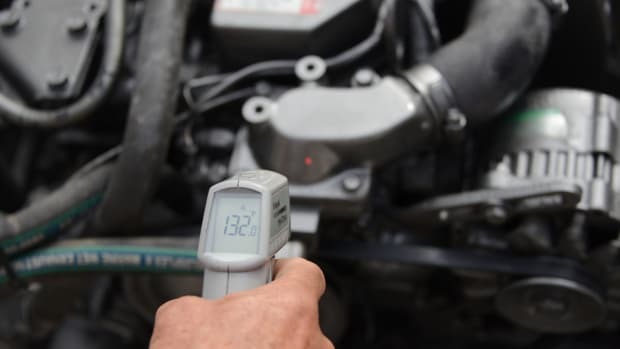 If the water had a lot of silt in it, or if you dropped the tool on the bottom, special care must be taken when washing it to remove silt, particularly a tool with moving parts, such as a socket wrench. I have a special technique for bottom cleaning. I use Interlux Ultra bottom paint, which, coupled with my cruising patterns and diving regimen, usually gets me three years between haulouts. I try to avoid any cleaning of the bottom the first year. It isn’t needed. The second year, if there’s scum on the bottom (usually from a lot of waterborne mud being flung onto the hull by current), I’ll carefully scrape it off with a broad-blade paint scraper. This removes foreign material but does not take off an appreciable amount of paint, leaving it to continue working for me. The third year, I’ll begin using a brush and/or 3M cleaning pads. This not only removes any growth, but it removes outer layers of paint, leaving fresher layers to continue working. (I always put on two or more coats, and more than that around the waterline where the sunlight and warmth is more conducive to growth.) I’ve used this tactic on both hard and soft bottom paints and found it to help with both types. When I’ve changed propellers, I’ve used either propeller pullers or popped the props off by hitting the hubs with a maul. This latter method requires knowledge and experience as to where and how to hit the hubs. I wouldn’t advise doing it without both. Even using a puller can be risky, particularly if the propeller pops off unexpectedly. I always leave a nut on the end of the shaft to stop the propeller. I jam a block of wood between the hull and a propeller blade so that the shaft won’t turn with the wrench as I back off the shaft nuts. 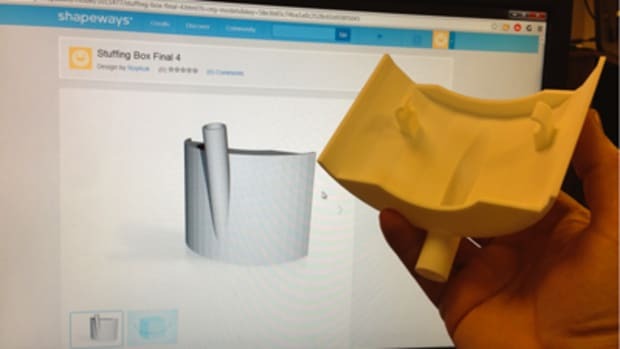 Cleaning bow thrusters can be very difficult underwater if there are two blades, because it isn’t easy to get to the back side of the blades. Barnacles inside the tunnel or on the blade will substantially impair the unit’s power. I’ve used a large screwdriver, diving gloves to protect my reaching fingers, and even large right-angle Allen wrenches to reach barnacles behind the blades. It takes a lot of patience and good light. If the propellers have gotten too fouled, I simply remove them and clean and paint them. Always disconnect all power to the bow thrusters before working on them. An accidental start could take off fingers or hands—or worse. To clean out through-hull holes, I use a rounded point table knife or, for the smaller ones, a carrot scraper. It’s obviously important to avoid reaching inside the through-hull with your tool and cutting a hose. As a minimum, have a long-sleeve wet suit, dive boots and flippers, heavy-duty gloves (that will withstand sharp barnacles), and a good mask and snorkel. The thickness of the suit you need will depend on the water temperatures where you dive. If you may be going down in colder waters, buy a head bonnet. The body loses a lot of heat from the head. Also, this helps protect your scalp from barnacles should you have your head against the hull (not unusual). I also use dive weights to give me only a slightly positive buoyancy so that I don’t have to expend a lot of energy staying down. It’s critical to use the right weight for your body and the equipment you are carrying and to attach the weight with a well-designed weight belt so that you can instantly and easily discard it. A good underwater flashlight is critical. There are many on the market. Sometimes you need one on your head; sometimes you can use a handheld unit. Pelican brand lights are the ones I’ve found to be most likely to work well consistently and to be within my budget, although there are other dive lights that are also excellent. All dive lights must be maintained well, including proper lubrication (usually silicone-based) of any gaskets and O-rings. Never overlook safety equipment. Display a dive flag. Always have someone watch-ing. Have an emergency diver’s flotation device designed and built for the purpose so that it’s reliable and won’t get in the way or snag or inflate prema-turely. This is even more important if you aren’t going to wear a wet suit, which provides a great deal of buoyancy. I never go down without a good dive knife strapped to my lower leg. You never know when you might need it, and for what. I prefer mounting it to my lower leg because, in my opinion, this arrangement gives me more versatility in reaching it. Most of my bottom work has been by free diving. I go up and down, holding my breath while down, until I get the work done. I prefer this because it’s less cumbersome, I can get in and out quickly, and there’s less gear to get in the way or become snagged on something such as a propeller or strut or stabilizer. But diving this way obviously requires much more time and energy. Also, I’ve been doing this most of my life, and I’m accustomed to it. This is probably not the method you’d want to use, although free diving has its advantages for quick inspections when conditions are appropriate. There are dangers with any kind of diving, including free diving. For example, it’s easy to be holding your breath, intent on a task, and to lose your sense of reality as your brain becomes oxygen deprived. Also, if you do get snagged on something, you have almost no time to disengage yourself. If you use scuba tanks, you must be certified and also in good shape, even if you only plan to descend a few feet. 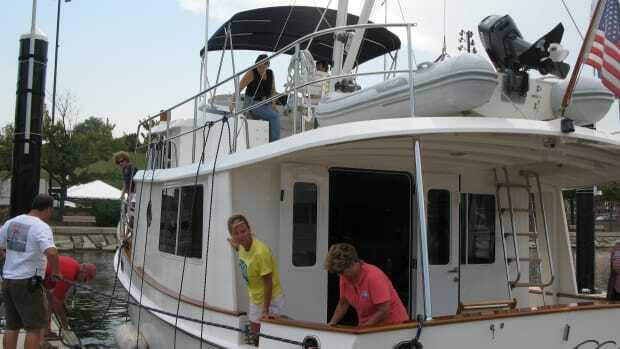 You will also need a safe and easy way of getting into the water with the tank and getting back aboard. Scuba tanks and their gear create, in my opinion, more opportunity for getting caught on something on the bottom of your boat. More and more people today are using “hookah” equipment. I like this type of equipment because you can get into the water relatively quickly to do a job, you don’t have to deal with heavy tanks, there’s less snag potential than with scuba tanks, and you can easily work all around your boat, staying under for significant periods of time. Hookahs also offer a huge surplus benefit in the category of just plain having fun. With a powerful enough compressor and enough hose, two or more people can explore underwater around the boat. This equipment consists of an air compressor (approved for production of breathing air), a hose running from the compressor to a regulator, and a mouth piece. (You still need a mask and flippers and, preferably, a wet suit.) While this sounds simple, there are many safety issues and nuances in the equipment requirements that are perhaps not readily recognized, and it’s important to buy quality if you buy a hookah. For example, air filtration is important. It’s also critical that the compressor be designed specifically for this purpose so that there’s no risk of oil getting into the air. Hoses must be of sufficient quality and type for the job. Brownie’s Third Lung (browniedive.com; 800.327.0412) has become almost synonymous with hookahs in many circles. I mention Brownie’s because they say they began in 1969, and they produce a wide range of diving gear ranging from military and search-and-rescue applications to megayacht tank-fill systems to everyday gear that can be used on a typical cruising boat. Their product line gives you an indication of the equipment available for this sort of underwater fun and work. A Brownie hookah can be powered by an AC electric motor (110 or 220 volts) or by a hand-start gasoline Robin Subaru engine. 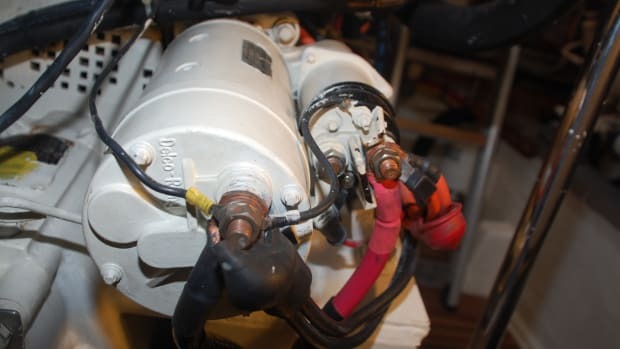 A benefit of the gasoline engine is that you can take the units with you in your tender for diving away from your boat, and you can also get them with a special float so that you can drift dive, towing the compressor along behind you. Electric systems come in water-resistant yellow plastic pods for convenient storing and are usually used from the boat for bottom work and nearby exploring. Many are now being built into some boats as an option. These include Nautica and Novurania inflatables and Deep Impacts, which are 33- and 36-foot center console boats. Available 12-volt units allow the convenience of keeping them in the tender as permanent equipment if you wish. Different configurations and compressor/motor units and kits allow varying numbers of divers to be hooked to the same compressor, varying horizontal dive radiuses from the central compressor, and greater dive depths. It’s important to realize when studying hookah products that depth distance is a different concept from horizontal distance. As you descend, water pressure increases, and the power of the compressor and regulator must accommodate that pressure. This isn’t an issue as you simply swim away from the compressor, at or near the water’s surface. 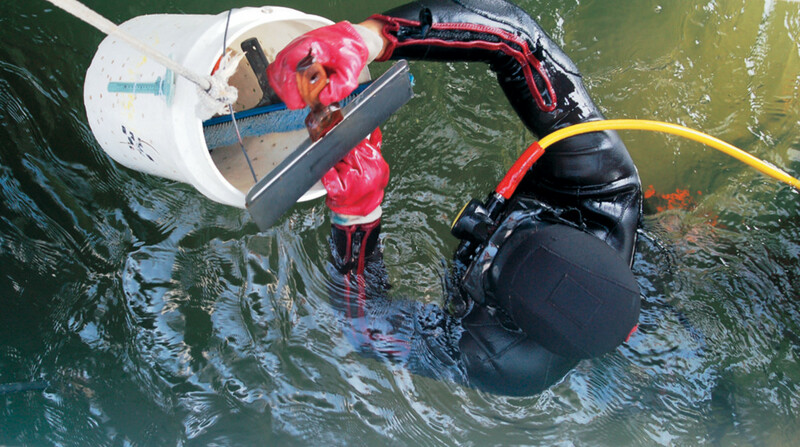 Brownie’s says that their 115VAC Electric 140 model, for example, can support one diver to a depth of 60 feet. Other models are more powerful. The 12-volt models that you can use in your tender may, of course, deplete a battery, but not as quickly as you may think. You would have to carry a well-charged battery dedicated to the unit. 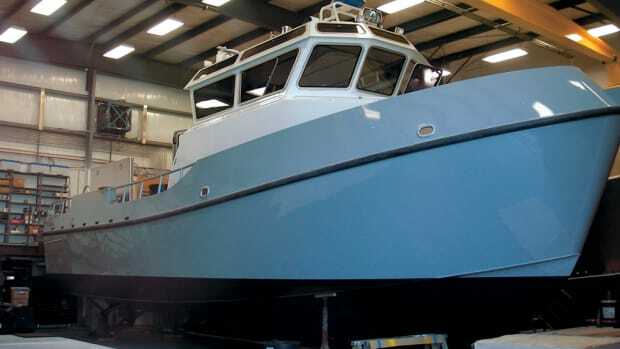 Brownie’s says that its B230X-BOAT has an average run time of 1.75–2 hours using a single 31 series 75Ah battery. The company says the unit can support one diver to 60 feet, or two divers to 30 feet. The company also says that a larger unit can support two divers to 80 feet and three divers to 40 feet. The company even offers “The Pressurized Snorkel,” which consumes 6 amps from a fully charged 12-volt battery and allows you to go down 6–8 feet for very light work (such as, perhaps, clearing a prop or performing an emergency hull inspection). Take a good, approved scuba training and certification course, regardless of the type of diving you do. Scuba diving isn’t for everyone, and it’s beyond the scope of this article. But a course will enable you to do more things underwater and to have more fun—even if you don’t have the physical ability to complete all of the course requirements. A course will also require that you get a physical by a doctor, which will indicate whether your health would be an issue. More importantly, taking a course will help you find out whether you’ve got the ability to do the things you need to do, will teach you how to handle many problem situations, and will help you recognize potential problems. In short, it could well save your life. Brownie’s includes with your purchase free online education in the use of its hookahs. But you still should have the skills, physical ability, and training necessary to be in and under the water. I’ve told you about what I do and what I’ve seen others do. The ability to shallow dive around the boat has given us great pleasure, saved us a lot of money, and made us safer. This doesn’t mean it’s for you. That’s a decision you’ll have to make after carefully weighing all issues and balancing the risks. If you decide that this might be for you, don’t hesitate to get a medical opinion if there’s any issue of your ability—and get training. And if you do take the plunge, enjoy!